Sergio Beercock is a man with an eclectic background. Born to a Sicilian mother and an English father, in Kingston Upon Hull, he now lives in Sicily, where he produces his music while also writing for the theatre and acting. Something of a Renaissance Man! 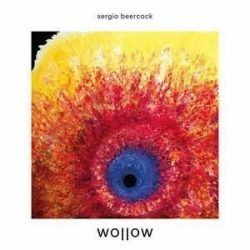 “Wollow” is Sergio Beercock’s debut album and there’s much to be impressed by on his first official release. He has a good, light tenor voice that really grows on you with repeated listening and he’s clearly a talented musician, playing the majority of instruments on the album, including guitar, piano, charango, synthesiser and Bolivian flute. But while his press release cites his influences as decidedly American – Tim Buckley, Nina Simone, Sufjan Stevens, Devendra Banhart (and you can hear their influences in some of his work) – this is a very English sounding record. That’s partly down to Beercock’s delivery, he does have a very English quality to his voice, and partly to the songs, which really wouldn’t sound out of place in any English folk club of the last 50 years; And with titles like Beauty of Dirt, The Barley and the Rye, and the first single from the album, Battle for Attention, you have a flavour of the album before you’ve listened to a note. These are all good songs, and there are plenty more on this 11 track recording, but there’s a predictability to them that seems at odds with the artists intentions. Given the instrumentation used and the influences cited you get the impression that Beercock set out to produce an album of left field, folk inspired songs. What he’s actually produced is a good folk album that is very credible without ever seeming particularly different or exciting. The one big exception is closing track Silencio, an original composition by influential Argentinian singer/songwriter Pedro Aznar and sung, a capella, in Spanish. With this track you get a feel for what Sergio Beercock could produce if he widened his horizons a little. Perhaps if he looked for more material from other writers that he could interpret, alongside his own English Folk songs, he could produce a more interesting and diverse album. “Wollow” is a good starting point from a clearly talented musician but he needs a more varied palate to work from if he’s to make a mark internationally. An interesting debut album that needs a little more variety.